How can fresh innovations emerge in the era of the Internet and social media? Coincidence, luck, reputation and the correct timing are, of course, crucial but social media and the permanent interconnectedness of today’s society have also changed the rules of the game. There is no doubt that there is a lot to be learned from the past. To take one example: the paint tube. The introduction of the paint tube led to the rise and glory of impressionism. Why? According to a sign behind the Crecy la Chapelle church in France, the paint tube was invented in 1850. It enabled painters to work outside as well as inside. So, painters went outside for the first time in search of beautiful light, resulting in the emergence of the famous school of Barbizon and, later, impressionism. The paint tube therefore, when added to the natural beauty of the surrounding area, directly enabled this development. Such a coincidental and lucky combination of factors can often only be understood in hindsight. The cultural development of impressionism was followed by an influx of money, followed by the construction of railways which enabled the well-off people to travel to Paris. Following them came the less well-off and, ultimately, industry. Looking back therefore it could in a sense be concluded that paint tube was an accelerator of the cultural and social revolutions in the 19th century. These examples illustrate the way new discoveries, combinations and solutions in the Internet era can work together. When technology and culture meet at the right time a form of synergy can take place, brought about by lucky circumstances and fortunate timing, resulting in a real wave of change. Let’s have a closer look at the paint tube story: firstly, the new invention started out on a small scale. Why certain new developments survive and others do not cannot always be foreseen in the beginning. Why did this particular innovation turn into a huge success while others, which looked at the beginning to be no less promising, failed? Why does one pianist or actor succeed and another, sometimes even more talented, fail? This is simply a question of interferences from different circumstances whose impacts can be understood only in retrospect. All the right junctions need to be in the right positions to enable the traffic to flow! How often does an end user invent something when trying to solve a very practical problem in an easy and creative way? Need an example? I can think of no single maker of cellphones that could ever have foreseen that an integrated camera could end up helping people remember where they parked their cars in a big city parking lot, or that a picture taken with this camera could be presented as evidence that a parking ticket was unjustified. The addition of cameras to mobile phones also allowed a new form of news collection: “civil journalism”. Just as in the story with the paint tube, the end user makes the decision on the usability of an innovation. Sometimes a catchy name (or a nice headline for an article) can open a door to success. The term “Crowdsourcing’ will certainly be a success because the description delivered by the word is very clear. In 2005 I used the phrase ‘moneyskype’, but now we understand that the term ‘crowdfunding’ is a much better indication of what is happening. This is alone is a crucial ingredient of success. New developments cannot be planned at the tables of managers by top-down decision making. Inventions and developments aren’t linear processes. Remember that innovation needs the correct combination of entrepreneurship, science, and culture. Any successful innovation is therefore by definition always an open innovation. A successful innovation can perhaps be compared with encountering your one true love. Many innovations fail because – and unfortunately you can only see and understand it afterwards – the window of opportunity was not open wide enough. It is obviously not enough just to come across the most beautiful person you’ve ever seen: the right time and in the right setting also need to be taken into account. You know for sure someone will win the jackpot. You can also be quite sure it won’t be you. Some of us win the the innovation jackpot. Luck? Serendipity? What can entrepreneurs learn from these views on the innovations? If an invention shows first signs of success the chances of a bigger success in the future increase. This is a commercial and operational wisdom used by experienced (private) investors. For that reasons they prefer to invest in small, scalable but already operational companies with a talented multidisciplinary team and a positive cash flow already behind their idea. From our vision of the paint tube this is a wise explanation. Obviously all of the junctions were in the right position, the timing was right, and the content and interference from different domains did their work. Because the life cycle of ideas is getting shorter however, scalability, global sales potential, production network &c. are becoming what really matters. Many startups fail in succeeding in the final of these aspects. This creates many opportunities for the ‘fast follower’ innovation strategy, as applied by many big corporations. This lazy strategy of corporations is actually based on the logic of private investors, essentially fitting it into the goal of continuous profit increase. What role does social media now play in the innovation process? I believe social media increases the chance of opening this window of opportunity. Or, to quote Bas van de Haterd, “Social Media increases serendipity”. As an example, he took two very busy people who were trying unsuccessfully for a month to make an appointment, only to discover through Twitter that they had been travelling on the same train the whole time. Social media enables hyper-connectivity and increases the chance that our junctions will be in the right position. It helps us to look over our own fence. 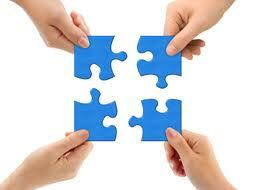 Social Media makes sure that the puzzle pieces needed to make a picture complete will find each other easily.